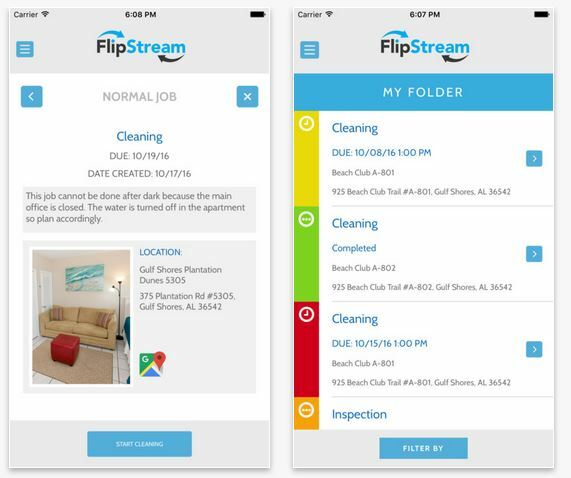 The FlipStream app – designed by iTrip Vacations – is a mobile-ready application that allows iTrip Vacations’ property managers to monitor the entire turn-over process from their smartphone. The app provides users easy access to everything they need to oversee the process in real-time, regardless of their location. FlipStream’s Mission Control Dashboard enables iTrip Vacations’ franchise property managers to oversee the progress of their guest flips and turnovers. From here, managers can inspect rentals, track cleaning and maintenance, and rate staff performance. With the dashboard integration into iTrip Vacations software, all listings and booking information import into the app. Once all data is imported, managers can monitor activity, rate companies, take photos, report damages and problems, and prioritize based on proximity. FlipStream also time-tracks assignments and uses GPS to re-sort assignments based on location and priority. Cleaning companies, inspectors and maintenance contractors also have access to the app in order to manage and communicate from the field. 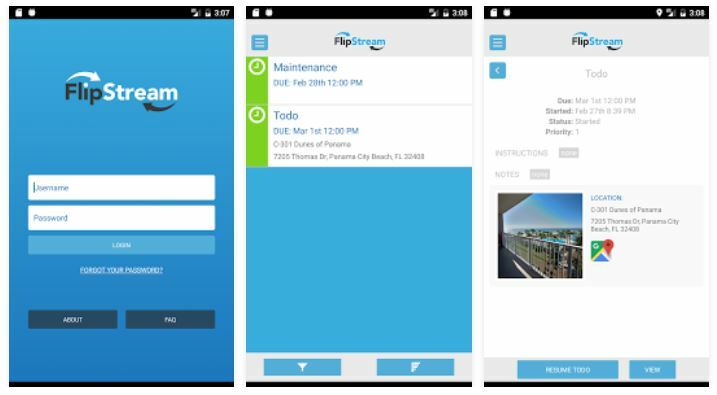 The FlipStream app is available to iTrip property managers on Apple and Android smartphones and iPads. Download the app from the Apple Store or Google Play to get started. The app houses a powerful camera that allows users to take photos and include them in the cleaning and inspection notes with only two-clicks. Managers can upload a total of 16 inline photos per item, each time-stamped and auto-captioned. Cleaning and maintenance teams can also take pictures of any concerns and/or damages, and safely store them for later reports. Managers have the ability to rate their cleaning and maintenance contractors, and have access to a timer that shows real-time progress. This enables vacation rental managers to keep accurate track of conditions and costs. In addition, the ability to rate work also informs other employees which companies to use and motivates partner companies to deliver high-quality service. Need to leave a special request? Remove an extra email, text or call, and add a comment in the item and save. This feature provides an easy way to communicate with contractors, cleaners and other employees who may inspect the property. The app also integrates with the device’s GPS. This enables users to smart-sort and prioritize items based on importance and location. In addition, users can rearrange cleaning and maintenance tasks for contractors, place items at the top, and reassign tasks based on who is in the area. These features help ensure that important tasks are handled first in a timely manner. Don’t worry about losing data. FlipStream backs-up all inspections and reports, so managers never worry about losing valuable information. Users also have a tech support team available 24/7 to answer questions and address functionality issues. For more information, email todd@itrip.net or call 615-557-3664.